I am a Christian, and I consider myself to be an individual with common sense and a good understanding of the surrounding world. However, that's not the case for everyone. There are, unfortunately, some retards what have misunderstood the message of God. I would like to start off by saying this: Going to church does not mean you are a good Christian. The church is supposed to be a place where you should go whenever you want to, not because you have to. I hate all those retarded parents what forcefully bring their children to the chapel only so that they can brag about how good followers of God they are. Well guess what. You're not. In fact, when you are going to the church with more makeup than the Joker, you just make yourself look like a retard. Let's not forget about the kids what end up thinking that being a Christian is an unbearable chore. Secondly, we have the fake Christian. I am talking about those bastards what always, when asked, say that they are Christians, yet they act like the lowest scum on Earth. I am very sorry to tell you this bro, but laughing at cancer-diseased people does not make you the most charitable person on Earth. Thirdly, the ''Christians'' what desperately try to convert people. Seriously, what makes you think you will succeed? Converting someone fails 99,9% of the time, and I doubt your case is the other 0,01%. Also, why would you try to convert someone? Maybe those people are happy being Buddhists or Atheists or whatever they are, so why would you try and convert them? We also have the people what want to ''enlighten'' people in ''the name of God''. I am talking about the absolute idiots. Pretty much, these mouth-breathing retards try to show the whole world their ''massive intellect'' saying stuff like: The homosexuals should be killed (Very known one), Atheists will burn in hell (Because apparently they know everything about God's plan), masturbation=HELL, etc. Heck, I even saw a person what thought that the Earth is in the middle of the solar system. Yes, I am dead serious. And believe me, it wasn't a troll. Someone is actually believing that the Sun is revolving around Earth. We have reached a new level of stupidity right here. Anyways, I am gonna go chug some bleach now, have a good day and remember that it doesn't matter what religion you belong to, you can still be an idiot. This post has so many issues I can't even give you a real reply. While I agree with some (a lot) of what you said, your delivery killed it. I'm too tired to even go there. (10-20-2013, 01:48 AM)Wondrer Wrote: remember that it doesn't matter what religion you belong to, you can still be an idiot. Believe in whatever gives you peace...But about the idiots...They're out there in large numbers. When I was going to church many years ago, the preacher even made a comment about them. He said" here they are in church, shaking your hand saying peace be with you, but as soon as they get to the parking lot their cutting you off saying, I'm gonna get a piece of you!" The sad thing is they don't know how hypocritical they are. It's like as long as they go to church they get to do whatever, and true religion shouldn't be about that... It should be about inner peace & that's it. Having said that, I don't believe in any organized religion, but I believe in people being happy getting peace through whatever means they can. I'll never forget a woman I used to work with was chastising someone who was also a Christian but wasn't able to get to church or help out as much at the fundraisers. This poor girl felt so bad afterward, I went up to her and said "no god I know will hold it against you".People should STFU!!! including me, so I'll end here. 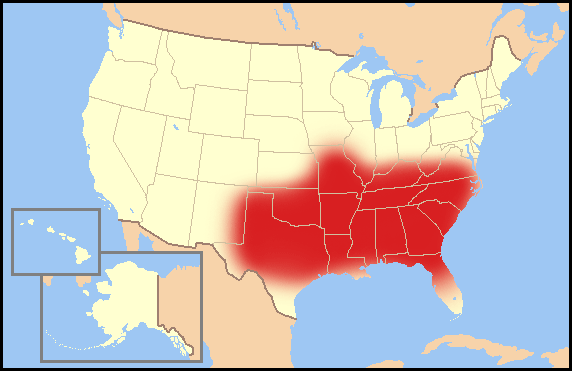 The region of America dominated by Christian fundamentalism, known as the Bible Belt, is shown below. So there are a lot of things about Christianity that bother me. The biggest one is the belief in going to hell if you are atheist, agnostic or whatever and you done things that are self-indulging like smoking pot, whatever. Nobody is born evil. And this one bugs me the most. When there are troubles in life, instead of getting ideas some christians tell you: "Let God take care of it". This reduces the victim of thinking for him or herself. They ask a diety to take care of their problem. Does people believe that people help other people because a god enabled them to be there to help them and have these people believe that they were there for a reason, or do a lot of people just help people to help people because it's good for society and there never had to be a reason why to help someone? Yes, the good old term "Faith". It's pretty much self explanatory in the dictionary. Some people have confidence that god exists because of how good a lot of things look. Like, art, going outside, listening to music, etc. That's understandable, and some bible quotes teach Do unto others as others do to you. those parts are good, but not everything in the bible makes sense. Well, that's my point of view. Can't label people as crazy, just know that computers are doubling its size power every 2 years. PS: whatever happened to OP. He was doing good complaining about stuff???? Did his head finally explode over the stress??? Religion is a great business. In the United States alone, the Catholic church pulls in more than $170 billion annually. The Mormon church is much smaller, but it too pulls in a great deal of money. The Church of Scientology is tiny in comparison, pulling in just $500 million annually. It is estimated that if American churches were taxed on the local, state and federal level on the same basis as for-profit corporations, such taxes would pull in around $71 billion a year. Read about it here: --> Are Churches Making America Poor? I should become a minister or something.. Gets me some cash!!! Current time: 04-20-2019, 12:06 AM Powered By MyBB, © 2002-2019 MyBB Group.